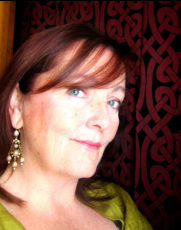 Céad míle fáilte (a hundred thousand welcomes) to the web site of Irish-American novelist Mary Pat Hyland. The Maeve Kenny Series: The Cyber Miracles, A Sudden Gift of Fate and A Wisdom of Owls; the trad Irish music parody 3/17; the suspense novel, The TerminalDiner; a family saga, The House With the Wraparound Porch; and a new mystery series beginning with The Curse of the Strawberry Moon. In 2014 she released her first collection of short stories, In the Shadows of the Onion Domes. Within this site you can read more about her inspiration, reviews and where to purchase her works in paperback and ebook format. Click HERE to receive the latest information on new releases, special sales and events. Click HERE for my Author Page. 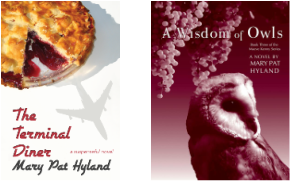 Want YOUR bookstore to carry my books? Tell them they are distributed by Ingram & CreateSpace. You can find the ISBN codes for each book on my Works page. JUNE 24, 2013: Selected by the Arts Center of Yates County as an Artist in Residence for 2013—the first writer selected by the program at its Sunny Point campus. DEC. 4, 2012: 3/17 reached No. 1 on Amazon France's English Language Kindle Humor Books. SEPT. 12, 2012: The Cyber Miracles reached No. 11 on Amazon Germany's Top 100 Bestseller List, Humor, today. MAY 17, 2011: 3/17 made it onto Amazon.com's Top 100 Bestsellers today! The Curse of the Strawberry Moon is now published in digital formats. Download it AMAZON or SMASHWORDS. ​Get your paperback copy at Amazon.com (and other online booksellers) today! Mary Pat Hyland's first collection of short stories. The book includes eighteen tales inspired by characters, gossip and local lore from the Triple Cities in upstate New York. The House With the Wraparound Porch, a family saga set in the Finger Lakes of New York State. June 22: AOH Members Book Club, Binghamton, NY. Discussion of the Maeve Kenny Series. February 14: 8:00 p.m. ET, Video chat with the Good Shepherd Women of Wisdom Evening Book Club in Colleyville, Texas. Discussion of The Curse of the Strawberry Moon. April 30: 12:30-2:30 p.m. Independent Bookstore Day author book signing event - Longs' Cards & Books, 115 Main St., Penn Yan, NY. Bring your books in to be signed! Oct. 21: Finger Lakes Litspiration - an evening devoted to authors inspired by the Finger Lakes, at Fulkerson Winery, Dundee, NY. Details HERE. Dec, 13: 2 p.m., Book discussion & signing for In the Shadows of the Onion Domes, The Book Vault, 46 Washington Ave., Endicott, NY. Nov. 15: 3 p.m., Book launch: In the Shadows of the Onion Domes, Riverread Books, 5 Court St., Binghamton, NY. The author will discuss and sign her new book. Oct. 15: Noon, Broome County Public Library, Book Review, The House With the Wraparound Porch, given by the author. Nov. 25: Meet the Author, Phelps Mansion Museum, Binghamton. Oct. 16: High Tea with the Author, The Highlands, Johnson City, NY. Oct. 16: Book discussion with The Literary Ladies, Endicott, NY. Sept. 18: Meet The Author, Fred & Harriett Taylor Memorial Library, Hammondsport, NY. Sept. 15-22: Artist Residency, Arts Center of Yates County Sunny Point campus, Keuka Lake, NY. Aug. 16: Book Launch, The House With the Wraparound Porch, RiverRead Books, Binghamton, NY. June 28, 2012: Discussing A Sudden Gift of Fate with the Newark Valley Book Chat. April 3, 2012: Review of The Terminal Diner, 7 p.m., George F. Johnson Memorial Library, Endicott, NY. September 10: Official launch of The Terminal Diner, 2-4 p.m., RiverRead Books, Binghamton.